Chinese economy has experienced unprecedented development since the 1980s, what enabled the country to replace Japan in 2010 as number two economy in the world – a place Japan held for more than 40 years. In the meantime, however, China has paid huge cost on the grounds of energy and environment. In 2008 and 2010, China overtook the United States to be the world’s largest carbon dioxide (CO2) emitter and energy consumer, respectively. These changes have brought about new and tough challenges to the Chinese government: to tackle climate change globally and deteriorated environmental damages domestically. To be fair, Beijing has started to take measures from the mid-2000s to tackle the issues of climate change and energy inefficiency. In addition to the efforts made to enhance energy efficiency of the country’s largest energy–consuming industries, the Chinese government has also made significant investment in developing renewable energy. China has currently got the highest installed wind power capacity in the globe and is also the world’s largest producer of solar panels. At the Paris COP in 2015, China has further pledged four main targets to be achieved by 2030: 1) to peak its CO2 emissions by 2030 or earlier; 2) to reduce carbon intensity by 60-65% from the 2005 levels; 3) to increase the share of renewable and nuclear energy sources to 20%; and 4) to increase forest stock by 4.5 billion cubic meters from the 2005 levels. A recent report by the Institute for Energy Economics and Financial Analysis (IEEFA) has even argued that China is setting itself up to dominate these sectors globally over the next several decades. Beijing has also launched a “war on air pollution” since 2013 with the focus primarily on reducing coal use. 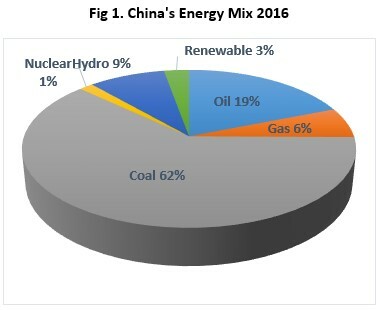 Indeed, as the world’s largest user of coal, China’s energy mix is still dominated by coal, accounting for 62% of the total primary energy in 2016 (Figure 1). Since coal emits the highest CO2 per heat content equivalent among fossil fuels, which is in average 85% and 34% higher than that of natural gas and gasoline respectively, it is essential for China to move away from coal use to reduce CO2 emissions and simultaneously improve air quality. In order to reduce coal’s share in the country’s energy mix, the Chinese government has actively promoted the use of natural gas. Between 2006 and 2017, China’s consumption of natural gas had grown from 59.3 billion cubic metres (bcm) to 235.2bcm, an average increase of 16% annually, while its production only grew from 60.6bcm to 147.6bcm during the same period. Such policies have certainly enabled Beijing to cancel more than 100 under-construction and planned coal-fired power plants by September 2016, equivalent to a total of 120 gigawatt (GW) of capacity. In China’s 13th Five-Year-Plan on Energy Development (2016-2020), published on 5 January 2017 by China’s National Energy Administration (NEA), coal’s share in the country’s energy mix was set to be squeezed out even quicker, lowering its share in primary energy consumption from 62% to 58% by 2020. Two months later, Premier Li Keqiang further announced a reduction of 50 GW of coal-fired plant projects to demonstrate Beijing’s determination towards greener economy. Around the same time, Beijing announced its successful transition from coal-fired heating provision into gas-powered. The 37% gap between domestic production and demand in natural gas has been fully filled via imports of pipeline gas, primarily from Central Asia, and via LNGs. But has not allowed Beijing to move away from coal quicker, or to have some room to manoeuvre in case of urgent shortage in gas supply, as shown in a recent example concerning government intention to curb pollution and the shortage of gas supply. The issue was originated by a new campaign launched by the government to switch residential and commercial consumers from coal to natural gas in wider areas surrounding Beijing. In a guidance issued in September 2017, jointly by the Ministry of Housing and Urban Rural Development, the National Development and Reform Commission, the Ministry of Finance and the NEA, 28 cities across 13 provinces in northern China were required to provide cleaner heating system by the winter, using either electricity or natural gas over coal, according to local availability. The switch was believed to save 9.2 mts of coal being burned, according to official sources. 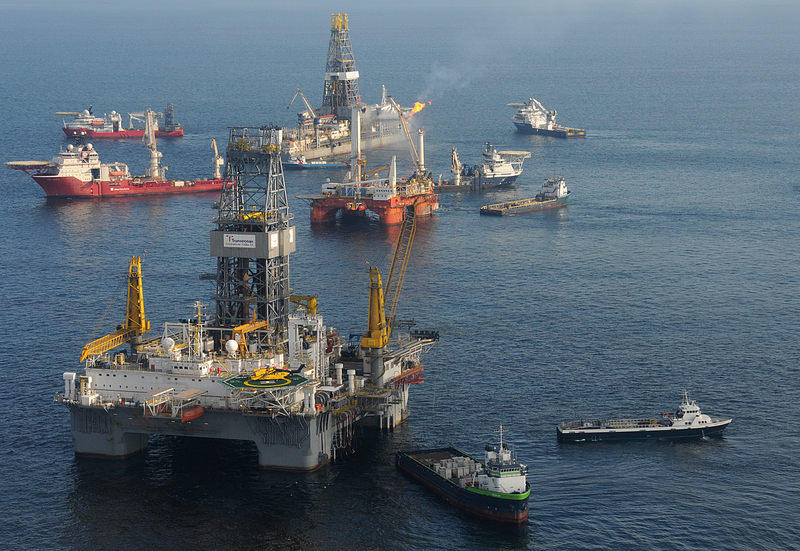 However, it soon became obvious that there was a severe shortage of gas supply to meet a massive rise in demand. On 28 November 2017, Hebei province issued orange alarm in gas supply, indicating a 20% of gas shortage in supply. The situation was shared by many other regions as well. Such shortage had left thousands of households as well as large number of schools and hospitals without heating over the winter. Amid a public outcry, the government reacted urgently to ease the coal ban, instructing affected provinces to continue to burn coal for the time being if not converted to gas or electric heating. It was fortunate that the chaos was resolved within a matter of few days and thus did not cause much losses, but it did trigger heated debates over efficiency and coordination of the government policy making and implementation. Taking Hebei Province as an example, according to the initial government plan of switching from coal to gas, about 1.8 million of households and 4,500 steam tons equivalent of coal-fired boilers would be covered. However, since local officials wanted to show better performance, the switch implemented had, instead, covered 2.6 million households and 11,700 steam tones of boilers, leading to 5bcm of additional gas demand for the winter season. What made things worse was a decline in pipeline gas supply from Turkmenistan in December, accounting for nearly 5% of China’s daily gas consumption. Under a normal circumstance, this would not cause much disruption in China’s gas supply. However, with sudden increased in demand and rapid rise of LNG prices, even a minor decline of Central Asian gas supply had shown some impacts. The discussion also suggested that the three major national oil companies – CNPC, Sinopec and CNOOC – need to collaborate more closely in sharing existing gas pipeline networks, and to build new pipelines. Currently CNPC holds monopoly of 70% of China’s oil pipelines and 90% of the gas pipelines, which requires fundamental reform to allow optimal functions of natural gas pipelines. The issue of China’s ability to fulfil its carbon reduction commitments was also raised, though nobody challenged the motivation behind Beijing’s policy measures. It was reported that China’s coal consumption in 2017 showed a minor rise of by 0.4% from the year before, which meant a 3.5% rise in China’s annual carbon emissions, after three years of decline. However, most analysts believe that coal-fired growth in China is over, as suggested by Figure 2. This view was also shared by Zhang Guobao, former minister of the National Energy Administration. 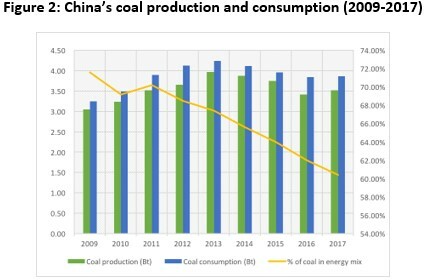 The bounce of coal consumption may be an indication of difficulties facing China’s energy transition, but this should not stop gasification of China’s energy structure. Even though natural gas is still regarded as a fossil fuel, it is much cleaner then coal and its increased share in the country’s energy mix will help China to tackle the challenges of climate change and environmental damages, before the renewable energy can claim a central role.